Not always tinsel and gingerbread men, the holidays can be a busy, stressful period for parents. Now imagine your child is in the hospital with a serious illness. Imagine not wanting to leave him or her, even long enough to shop for presents. Volunteers help parents “shop” for gifts for patients and siblings, to help provide holiday cheer to children and families in the hospital. All Kids Wonderland at Johns Hopkins All Children’s Hospital has reduced the stress for families and brought back the joy of the season with rooms filled with thousands of toys, stuffed animals, diapers, books, headphones, gift cards and so much more all provided by the generosity of donors and corporate sponsors for families. This “storefront” involves 250 volunteers that walk parents through a shopping experience that won’t take them far from the hospital room and won’t cost them any money. Families can select up to 10 gifts for the hospitalized child or siblings. And All Kids Wonderland is expanding. Traditionally, it has been available to in-patients, but this year it expanded to the hematology-oncology outpatient services in St. Petersburg, Florida, and also is in its second year at Outpatient Care, Tampa. Volunteers install batteries, help put toys together, wrap gifts and provide that overall holiday shopping experience and atmosphere for patient families. Gifts are always new items that are donated throughout the year from individuals and corporations. 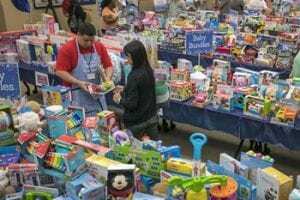 Corporations, local businesses, sports teams, churches and neighborhood groups help fill the shelves year after year to ensure that our sick children celebrate the joyous holiday season. Last year Child Life was able to provide gifts for 235 families in the hospital over the holidays. Gifts and items for infants are always on the top of the list as half our patients are under a year old. If you’d like to donate anything from diapers to socks to gift cards, you can drop new unwrapped items off in the hospital lobby.